So, I promised I would write about my adventures in pizza making this weekend. 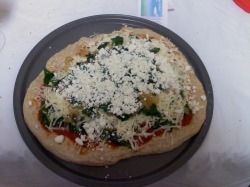 Chris and I made spinach, caramelized onion and goat cheese pizza with whole wheat crust on Friday night! We cooked the onions, then thew in the spinach for a bit while I rolled out the dough. First, I spread some Cabernet marinara sauce down, and then heaped on a thick layer of spinach and onions, put some low moisture part skim mozzarella on top of that, then added more spinach and onions, and then crumbled goat cheese! It looked DELICIOUS. I was kind of worried that it might take a long time to cook, but it didn’t! only about 25 minutes at 400 degrees. The crust crisped up nicely and the goat cheese got a little brown…it DEFINITELY added a great taste…not too over powering, but still soooo good. I LOVE goat cheese. While we were waiting for the onions to caramelize and the dough to rise, we snacked on Kashi Party Crackers, Monetary Jack Cheese, and Turkey Pepperoni. Yum! Also, we were drinking some Vino Verde. 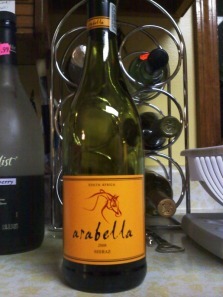 I LOVE THIS WINE! Its so light and delicious. I love it. We polished off the bottle! Overall, a tasty dinner. Well, I am off to New York City for the next couple of days…I’m sure I will run into some delicious food…can’t wait! I started today off great with a delicious breakfast cookie!!! I was surprised at how good this was, with so few ingredients. Yummy. I got inspired by this post on Runner’s Kitchen. I’m so glad I tried it too. I also made a smoothie to go with it…a handful of frozen strawberries, a scoop of chocolate protein powder and about ¾ cup of light soymilk. It tasted like chocolate covered strawberries. A perfect breakfast! So this past week was pretty boring with food…I didn’t go out any place special, except for Monday night. I got sushi at Shogun in Delmar. I used to LOVE sushi, but lately my taste for it has kind of diminished. I got the “healthy roll”, with shrimp, carrots, cucumber and avocado. No rice to be found! But it was wrapped in rice paper, I believe. A bit too chewy for my liking, so I just ate three pieces. For an appetizer I got the tofu salad with ginger dressing. I LOVED the dressing, it was so tasty. But the tofu itself was too mushy and bland. I probably wouldn’t order that again. Dessert was the best part. I skipped the cheesecake, so I ordered the peach sorbet, which was fantastic. The presentation of their sorbet is amazing. The sorbet itself was inside a frozen peach, which can be eaten. It was sooo delicious. My favorite dessert there so far…not including the green tea cheesecake! So basically I didn’t get hungry again on Saturday until about 8:00 at night, when I met my cousin at the Wine Bar & Bistro on Lark. I ordered the antipasto, a cold dish, which wasn’t that filling, although rather healthy! I felt good about that, but since I wasn’t too satisfied, I ordered the Kahlua Chocolate Cheesecake, which I believe comes from Cheesecake Machismo. That was superb!! No more cheesecake for a while!! I also ordered a glass of my FAVORITE wine, the Dragonstone Riesling. I love it. So much. Sadly, no photos from the wine bar. Sunday I decided to go to the gym to work off some mac and cheese, so I went in thinking, “Today is the day I will run five miles,” and guess what? It happened! I felt so good after that. 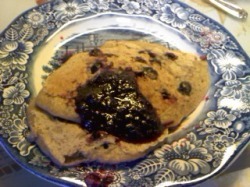 During the week I was craving pancakes, so I made oatmeal blueberry pancakes from scratch. They came out a bit too mushy for me…but still tasty. I think I just needed to cook them a bit longer, but I was so hungry I didn’t wait. Instead of syrup I topped them with my aunt’s homemade blueberry sauce, and it was delicious. Tonight I am going to make goat cheese pizza, so I will post about that later on to let you know how it goes! Ah, the weekend of somewhat unhealthy eating. I usually try extremely hard to make good decisions while eating out during the weekend, but it can be tough sometimes. Saturday I went to the Honest Weight Food Co Op for the first time. Its located on Central Avenue in Albany. It was a little bit intimidating at first, because I had no clue where anything was, but after a while I got used to it. I had my little list and found mostly everything I was looking for! I would definitely like to go back for a second try…although the prices are kind of expensive if you don’t buy in bulk, I’d still like to back there to find some specialty items that I can’t find in normal grocery stores. After the co-op I went to Justin’s on Lark with Chris and Liz for a late lunch. I got the Brie & Apple Sandwich, which was HEAVENLY. I swear, the apple butter they use tasted just like an apple pie. I love it so much. They serve so much food there! For a side I got pasta salad and FRIES, which I didn’t know would be extra; otherwise I wouldn’t have gotten them. Oh well. So Saturday night I went to the gym on my way home from Albany, and ran 2.0 miles, mostly because I was already tired, but felt I needed to get some kind of a workout in. After the gym, I went home and made my first Green Monster. I was actually pretty surprised at how good it tasted! I was wary about the spinach, but you can’t actually taste it. I tasted mostly banana, which was yummy. I threw in a couple strawberries as well. I’ve had about 3 more since then, including one for breakfast this morning, in which I added some almond butter! A pretty good way to start the day I think! Sunday I ran another 2.0 miles on the treadmill, and took Monday off. Today during my lunch hour I ran outside since the weather is pretty nice! Probably for about 2.5-3.0 miles, for about 30 minutes. I love running at lunch time, because when I get home I can relax instead of worrying about fitting in my workout or driving to the gym. So, tonight I was in the mood for some pizza, but not the UNHEALTHY kind, so I made up a couple of pita pizzas for dinner. I remember this idea from when my mom was on Weight Watchers years ago, and she used to make mini pizzas with pita bread for the crust. I started doing the same thing when I began eating healthier. 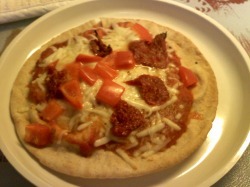 I use Joseph’s Whole Wheat & Flax Pitas for the crust, plain pizza sauce, and low-moisture part skim mozzarella cheese. I topped them with some red pepper and sundried tomato. So yummy! Defintely helped my pizza craving! To go with my pizza, I had to have some red wine, of course. This is a bottle of Shiraz from when Chris amd I made some real homemade pizza a couple of weeks ago. I think Shiraz goes great with pizza. For dessert, I had to have my Edy’s 1/2 the fat light Samoa Ice Cream. My favorite. AND just because, I put an actual Samoa girl scout cookie at the bottom. It was SO good! They are definitely favorite cookie! I just say that it was my reward for doing so well with exercise this week. Yesterday I went to kickboxing during my lunch hour, which I love!! And then last night I ran 3.1 miles in under 30 minutes, on the treadmill. This was a first for me! My fastest 5K time so far. I was really happy about that. And then I ran again today on my lunch hour for about 30 minutes, which I think comes about to be about 3 miles on the corning preserve trail. Now my legs are fatigued, but I feel great. A little sore and tired, but I’m happy with my workouts. The weather this weekend has been pretty nice, so I decided to take advantage of it! Saturday morning Chris and I went to the Troy Farmer’s Market to see what it was all about. During the winter it is inside the Atrium, but in the summer it is outside by the river, and I can’t wait to go to that. But it was pretty cool despite being inside. They had some decent vendors — lot of meats and cheeses. I was looking for goat cheese but didn’t find any…next time I will ask. Chris amd I each got two bottles of wine from the Cascade Mountain Winery (New York wine! yay!) I got the Summertide (fruity white wine made with Seyval Blanc) and Harvest Rose. 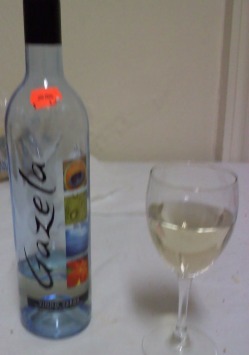 Both wines are pretty sweet and fruity…just what I like in wine! I can’t wait to open a bottle. I didn’t get any other food…since I had just stocked up the other day, but Chris got buffalo jerky and some natural peanut butter (tasty). I wish I could have gotten some pies/breads/baked goods, but they would have done no good for my calorie counting! Maybe I’ll get some jam or apples next time. After the market, we walked to Brown’s for brunch. It was DELICIOUS! I got a scrambled egg wrap with guacamole and cheese…served with a side of home fries. It was sooo good! 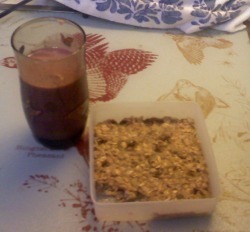 It even came with a small cup of granola, which was good as well. I wish the home fries weren’t so fried though, so I probably shouldn’t have eaten them all. I think brunch may be my favorite meal, so I didn’t feel that bad about eating it. I also tried Brown’s Raspberry Lambic, which was tasty. I had such a lovely day in Troy yesterday! So on the way home I stopped to get some supplies to make some chocolate chip banana bread. Chris gave me some ripe bananas to use, so I stopped and got the rest of the things I needed. The recipe called for plain yogurt, and they didn’t have a small enough amount of it, so I got fat free banana yogurt instead, which turned out to work awesome! the bread was delicious! Here is the recipe. I also couldn’t find any wheat bran, I just used all purpose flour instead. I didn’t put any walnuts in either. Still delicious. I gave some away to Brendan and I’m freezing the rest of it to give to Chris. I had the same idea for breakfast today, but I was in the mood for pancakes, so I just used some complete pancake mix, 1 mashed up banana, ground flax, and a handful of chocolate chips. They stuck to the pan, (I have no idea why, because I sprayed it), and came out pretty dark, but not quite burnt. Still tasty, even though they looked funky. I had three pancakes. And then I went to the gym and ran 4.1 miles! So after working out and having a light salad with kidney beans, apple, crasins, and carrots, I feel pretty good about myself today. Last night I went grocery shopping…spent entirely too much money on food. Thankfully I should have enough to last me the next couple weeks. For breakfast this morning I had a Thomas’ Bagel Thin with Apricot Mango Preserves. It was pretty good, a nice little change from the usual Special K cereal I have in the mornings. It filled me up for a while. For lunch today I made a salad with some of the things I got last night..Crasins and Walnuts! sooo good! I love this combination. The salad was delicious–spinach, sliced red peppers, baby carrots, crasins, walnuts with raspberry vinagarette dressing. However, I think I might need more protein in my salads to keep me full throughout the day–I bought some chickpeas and kidney beans for that. I was just lazy this morning and didn’t feel like opening the cans! I finally remembered my protein wings last night at the grocery store! (I just wish they weren’t so expensive). Honey BBQ is SOO good. I didn’t really know what to put with them so I just put them in a Joseph’s Flax & Whole Wheat Pita. It was pretty tasty. Four wings are only 120 calories, so even if I wanted the whole box for 240 calories–that would still be a decent dinner! I love these things. I got the chick’n strips too, and can’t wait to try them in a salad. I also stocked up on fruit — strawberries, necatrines, grapes, and apples. Yum. Jen; I am 25 years old and live in Albany, New York. I work full time, love eating delicious and healthy food, running, and attempting to maintain a healthy lifestyle!